Something huge has happened since I last posted. So huge that I'm even making all the pictures bigger, just to emphasize the importance. Can you tell I'm excited? I've never wanted anything so much as I've wanted a KitchenAid stand mixer. And my saint of a boyfriend got it for me for Hanukkah. 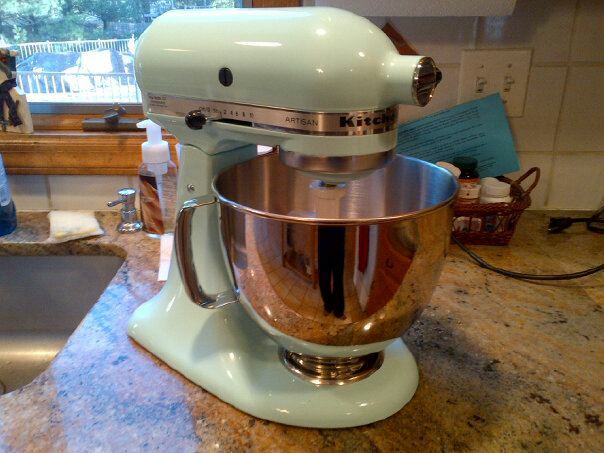 He even got it in the sweetest ice blue color to match my ice cream machine (see here). And so now there's a whole new world of delicious recipes I can make, like cinnamon rolls, breads, pretzels, homemade pizza dough, and challah. I had never made challah before. Well, that's sort of a lie, I made it in preschool once and ate the entire loaf before I got home. I meant to share it with everyone. Whoops. So 18 long years later, I was ready to tackle the recipe (with the help of my new mixer, of course). It was a process. From letting the yeast bubble to making the dough, then letting that rise and then making the loaves and then letting those rise and then baking to the perfect golden brown... it might have been more than I bargained for. Except that when the two glossy braided loaves came out of the oven and the whole house smelled like fresh bread, it was worth it. For my first attempt, I followed this recipe from The Challah Blog to a tee. Next time I might try playing around with how many eggs I use because my family's used to a lighter challah. This recipe yields a thicker, more dense loaf. It's perfect for french toast or bread pudding, or just for toasting up with some butter. Oh and on a complete side note, my picture quality will be drastically improving because I just purchased a Nikon D5100. No more blurry/grainy/overall bad photos for me!